In Norse myth, the Valkyrie was a divine maiden of battle, one of the chosen women who served Odin by selecting warriors from the ranks of the recently dead. This Valkyries Corset possesses matching Norse style that is perfect for a warrior-woman. This armor is fitted for a woman, as it consists of an armored, corset-styled top that combines rich and luxurious hues of brown with black accents to create something fit for a true maiden of battle. 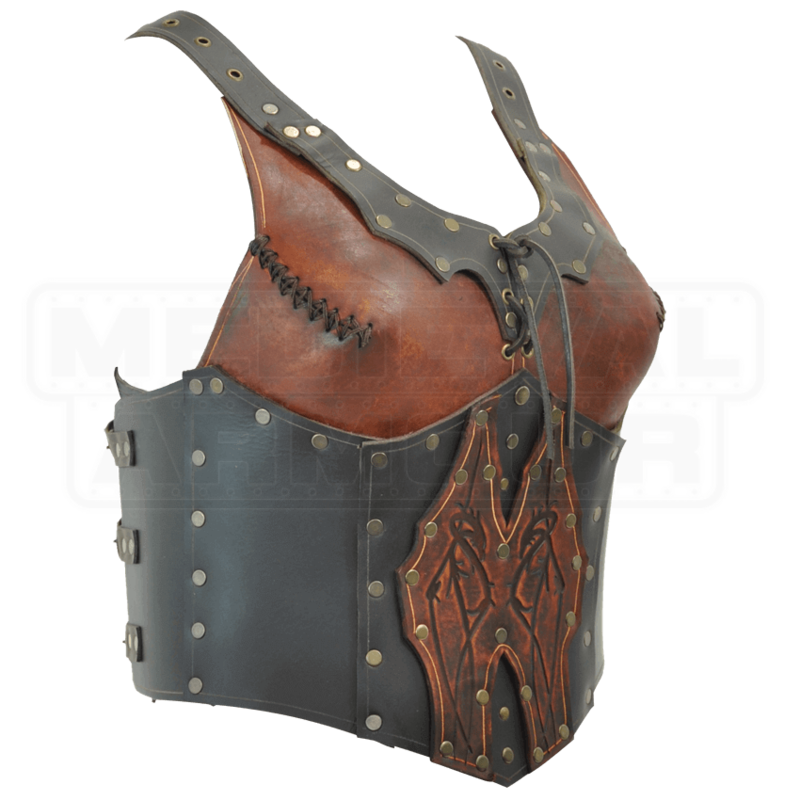 The corset-styled breastplate features a black abdomen that is decorated with twin brown leather plates adorned with Celtic dragon engravings. 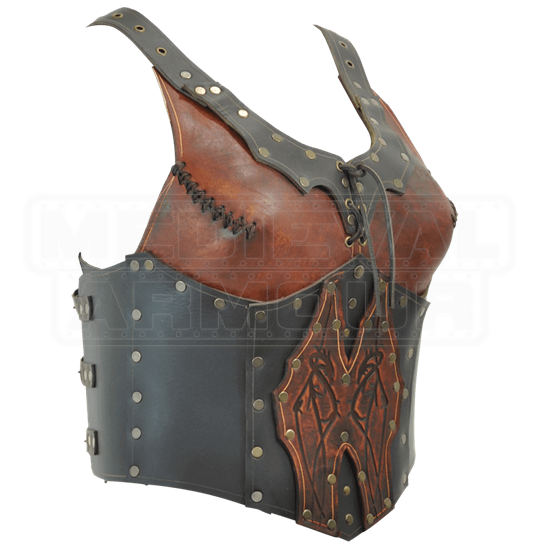 The top of the armor features thin shoulder straps set with grommets, while the chest of the armor is a single layer of shaped and stitched brown leather with lacing-style closures in the front. The armor is crafted almost entirely from 9-10 oz. leather, making it lightweight to wear yet strong enough to withstand the rigors of LARP and mock combat. This armor is available in one color and four different sizes. The corset style top is fastened via 8 small leather straps with buckles on the back with one over each shoulder and three on each side. Each size is also somewhat adjustable to personal preference and comfort. With that in mind, please order your armor in the size that closest matches your personal measurements, and then adjust to comfort. For a woman looking to retain her feminine beauty while still showing off her warrior persona, there is no better piece of armor to wear than this Valkyries Corset, as it perfectly shows off that, even in Norse myth, women were just as capable as men where when heading into battle.